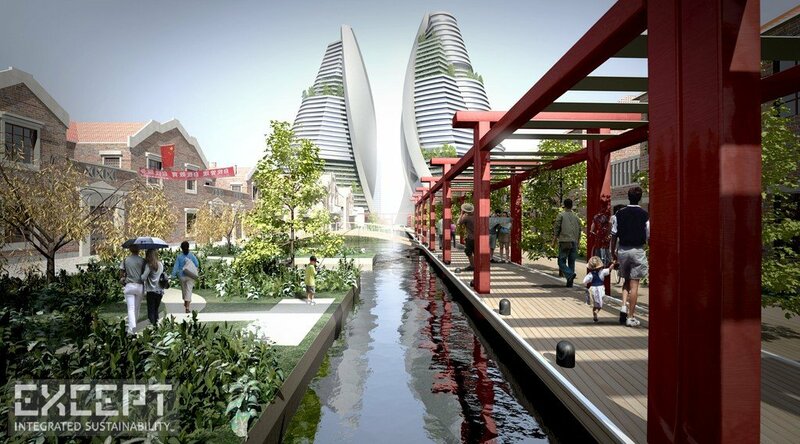 The plan makes use of both the macro-economic and local benefits and problems of the Chinese economy while using solutions that assist sustainable growth and social development in otherwise chaotic and multi-faced city growth. 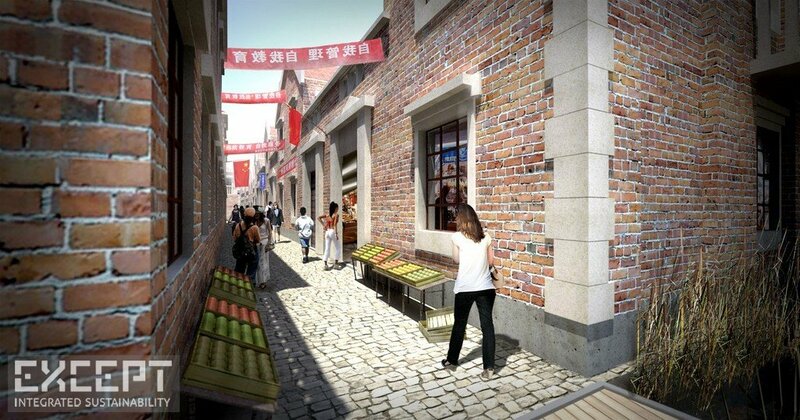 Re-introducing the city channel a part of Shanghai’s history is used for functional and economical benefit. 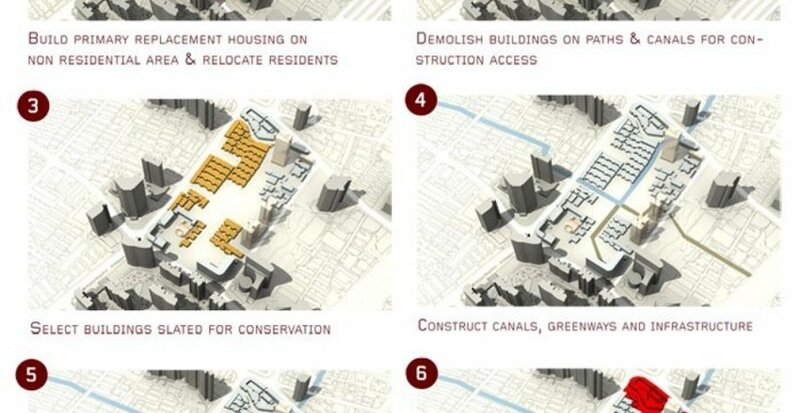 We propose a project that integrates several solutions to pressing problems of Shanghai, among which are pollution, traffic, replacement housing, decreasing agricultural land and runaway development, and lays the foundation for a sustainable city redevelopment. 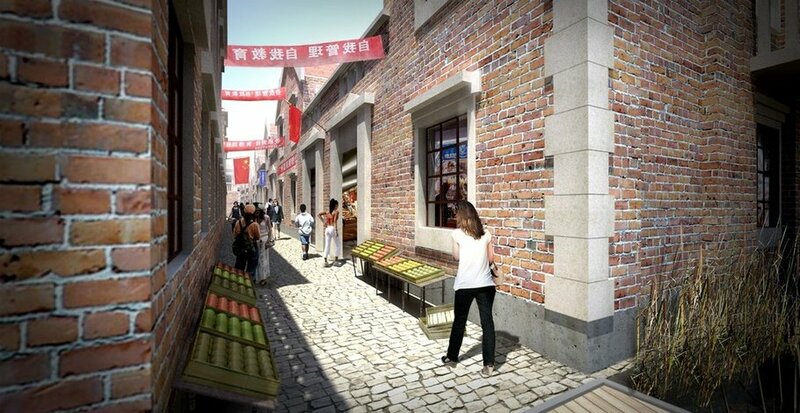 A master plan places core buildings in Shanghai’s typical Lilong social housing districts from the 1900’s which are on the brink of demolition throughout the city, and connects them through channel systems that are accompanied with bicycle and pedestrians thoroughfares. 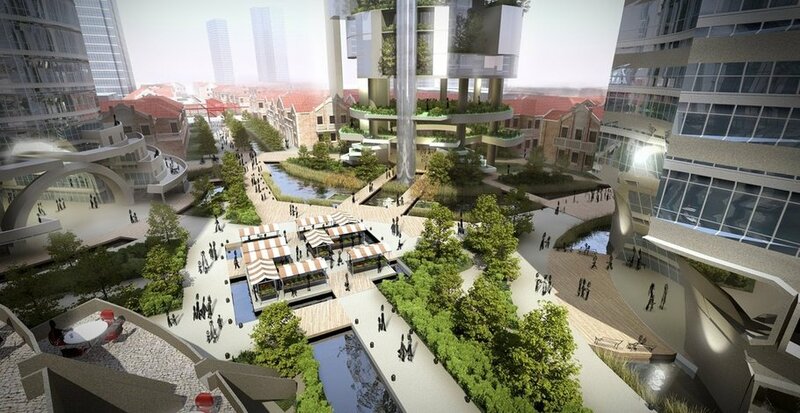 The plan gives new viability to the Lilong housing districts, and reinvigorates the city with local urban cores that encourage local trade, social interaction and high quality affordable living environments. 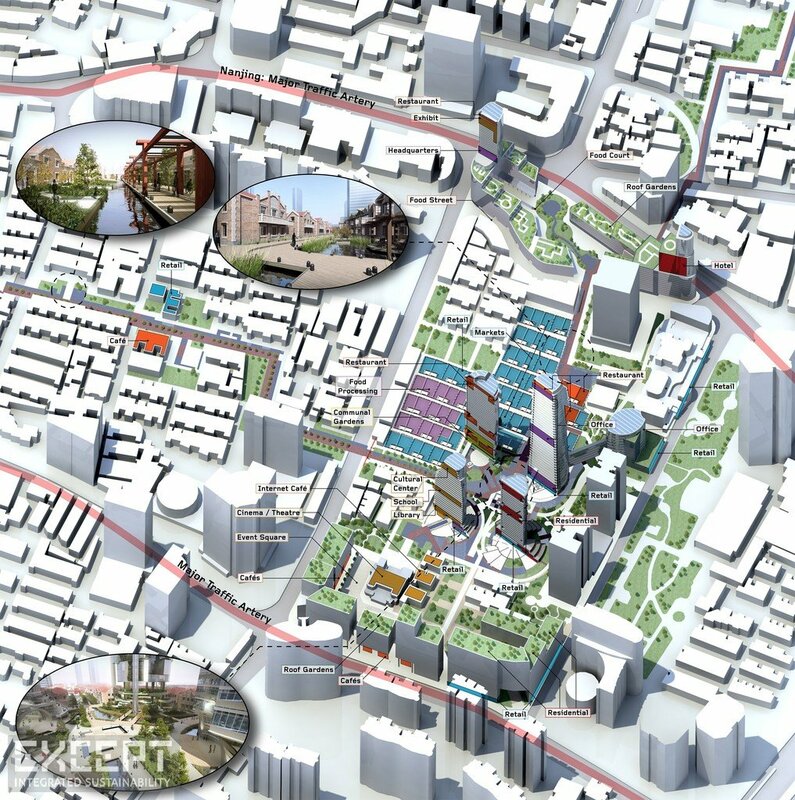 The cores contain mixed use urban centers activated by a program of market places, cultural facilities, public gardens, retail, commercial, residential and large scale urban agriculture. Some Lilong districts are sacrificed to create new viable conditions for others and the diagram of these Lilongs are turned inside out. The farms clean water and air while at the same time generating energy and food and laying a foundation for a sustainable future. It provides for the basic food requirements of 50.000 people per intervention, a range of 1km in diameter. Each intervention converts one lilong district to provide new viability to three others, plus surrounding areas. 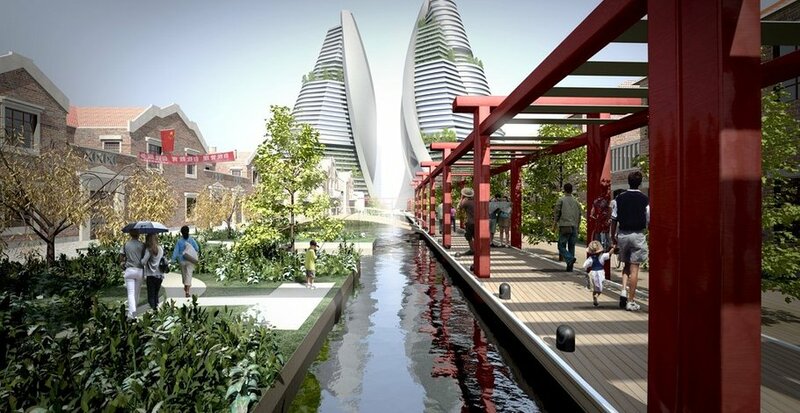 Clean water is produced from the polluted Sujou creek through evaporation within the towers, and fed back into the channel system to service large districts that require clean energy and water infrastructures. Renewable energy is captured from the sun through decentralized photovoltaic arrays, and through methane generation and subsequent co-generation of biomass composting in the basement of the vertical farms. City-heating districts are powered by this bio gas providing an efficient zero-carbon system. 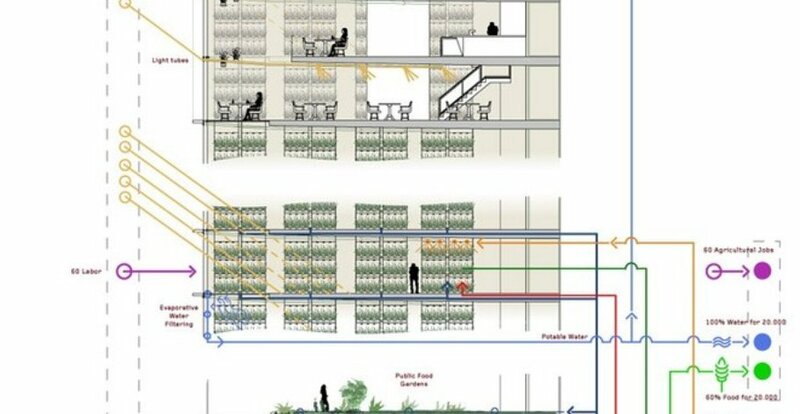 Shanghai’s enormous agriculturally skilled labor force, that is currently largely unemployed, is used in the high-intensity vertical farms, and the urban markets integrated in the immediate surrounding converted lilongs. The local food production cuts food imports drastically and city goods transportation requirements. 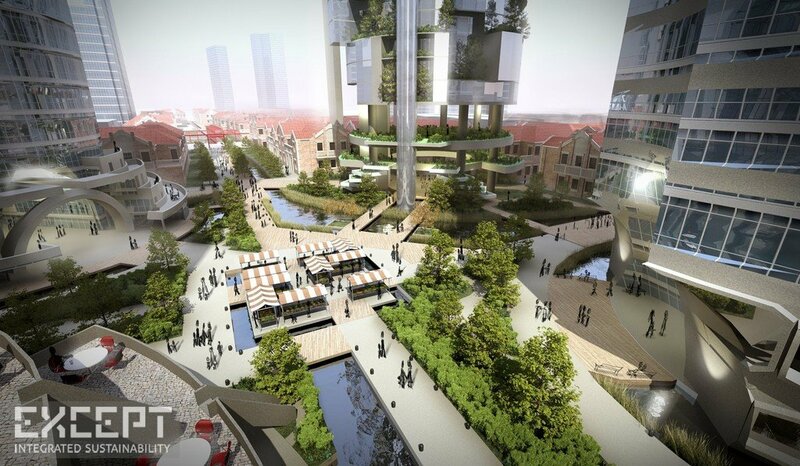 Extensive research in Vertical Farms and Farming techniques, the traditional Lilong social housing districts, the city fabric and the social situation on the site made us propose this project which focuses less on aesthetic experience versus the programmatic, social and environmental response of the site. 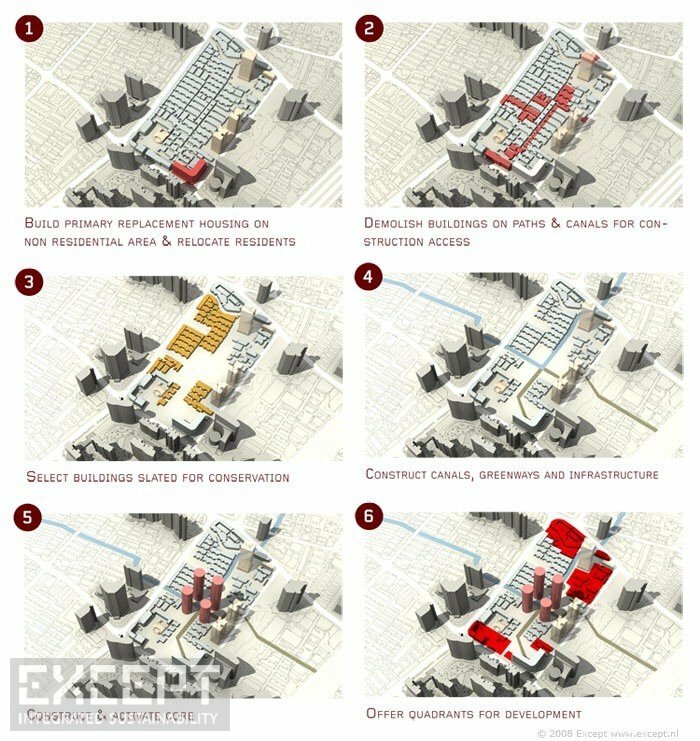 This project is an example of a symbiotic relationships of historical sites within a city, natural application of resource generation and far-reaching infrastructural conversion towards sustainable urban areas. The channel system provides a secondary transport route for slow traffic, transports and filters water, and increases spatial quality. Isometric urban diagram: towers in relation to channels and lilong areas. Some converted lilong buildings serve as indoor markets and food processing areas. 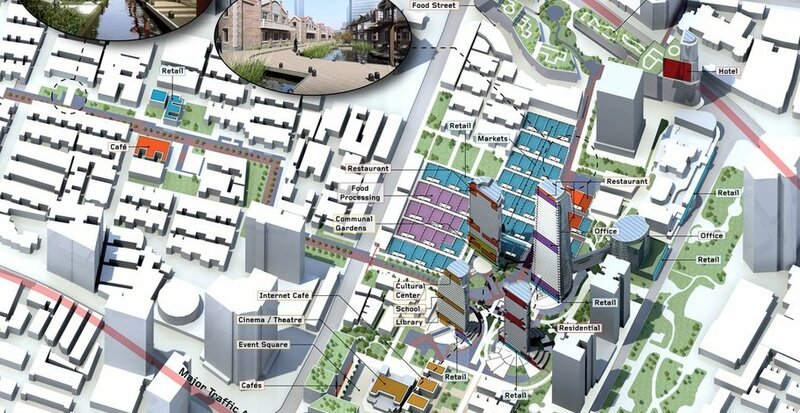 Phasing of the urban development plan. 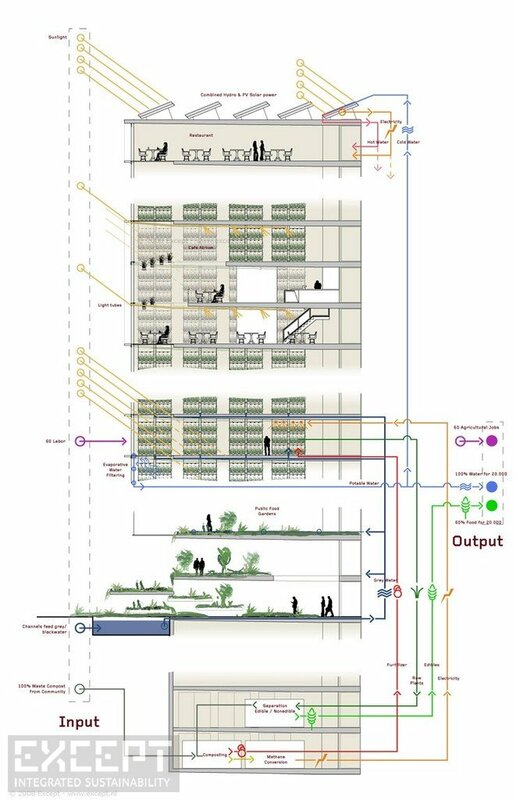 Diagram of the vertical farm system.